Above There is a sharp contrast in style between the two sections of the bank: the ornate corner section dates from 1900, while the more severe section on the right is about a hundred years older. Right This 1835 engraving shows the corner building (No. 1) and part of the one next door (Nos. 2–3) that used to occupy this corner site: they were built at the same time as their surviving neighbour (4–5). This group of houses was in the parish of St Martin's (Carfax) until that church was demolished in 1896, whereafter it was in the parish of St Martin's & All Saints until All Saints Church was deconsecrated in 1971. The ornate corner building that today marks the start of the High Street (Nos. 1–3) was designed by Stephen Salter and R. C. Davey. As Pevsner says, it “shows the consequences of seeing too much Jackson about every day. There is nowhere that motifs don’t sprout, alternately blocked columns, Ipswich windows, big, steep shaped gables”. The two old shops at the corner of Carfax have been removed, and two new ones, with suites of offices, are roof high. 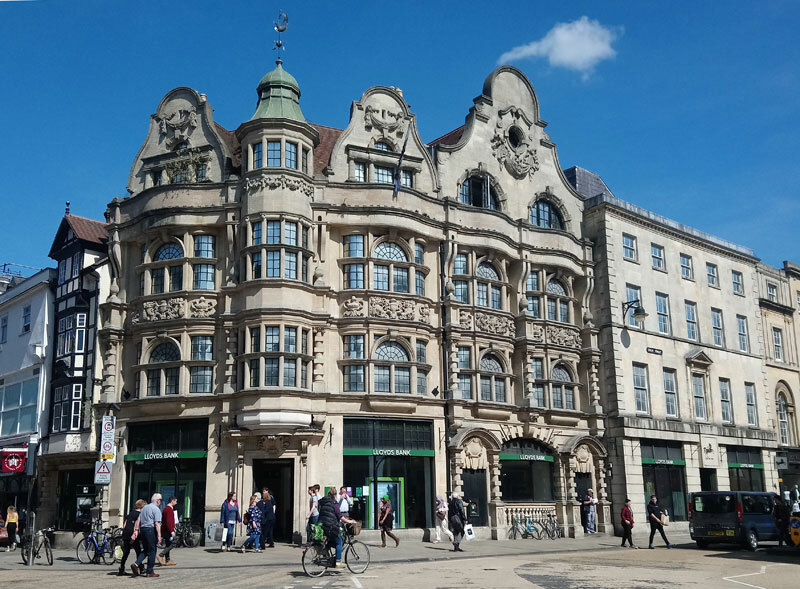 Both the shops have been already let by Messrs. Hamlet and Dulake; they will complete the block original design, of which Messrs Lloyds Bank was only an isolated portion. The renaissance style adopted does not appear to advantage in a narrow front, but is exceedingly effective in a block. The buildings are designed to bring in the utmost return in outlay, and as third floor offices do not let readily, a fine studio across the entire width of the two shops, having a north roof light, has been designed. The contractors are Messrs. Benfield and Loxley, the architect Mr. Stephen Salter, F.R.I.B.A., of Carfax, and the carving is being executed by Mr W. H. Feldon of Oxford. Lloyds Bank moved into the present Nos. 2–3 High Street as soon as they were built in 1901, and in the mid-1920s expanded into No. 1 High Street to the east (and around the corner into 1 and 1a Cornmarket Street). In the mid-1970s the bank also expanded westwards along the High to incorporate the more restrained premises next door, recently vacated by Sainsbury's. The 1851 census shows William Wiseman, the draper at No. 1, living over the shop with his wife, six children, and his sole employee, a draper’s assistant. By 1861, he was also living over No. 2. In 1871 the draper Joseph Blake was living here with his wife and two sons, an assistant draper and an apprentice, and two servants. In 1851 the business partners Henry Slatter (aged 61) and John Rose (aged 26) lived over Nos. 2–3, together with an apprentice and two servants. In 1861 William Wiseman appears to have occupied the upstairs of No. 2, while Henry Slatter continued to live over No. 3. By 1871 the bookseller John Rose lived over Nos. 2–3; he was still there in 1881: he was then a bachelor of 56, living with his 78-year old mother, his two spinster sisters, and a cook and housemaid. They moved to 16 High Street in 1901. In 1911, George William Barrett (48), the caretaker, lived over the new bank premises on the corner with his wife. In 1851 the hatter John Mawer lived over No. 4 with his wife and a servant. In 1861 the hatter’s shop was still there, but the upstairs was let out to John Rose of Slatter & Rose at Nos. 2–3 next door. The living quarters are not listed in the 1871 census. In 1851 James Gill the ironmonger, a bachelor of 35, lived over No. 5 with a housekeeper, a general servant, and a lodger. He was still there in 1861, when he is described as an ironmonger employing 18 men and three boys. The living quarters are not listed in the 1871 census. The premises were partly destroyed by fire on 2 April 1890. In 1890 the front of No. 5 was rebuilt after the fire and James Gill also took over the downstairs shop at No. 4. The ironmonger’s shop of Gill & Co. remained here until 1925. J. Sainsbury Ltd had a shop at No. 4 High Street from c.1910, and then expanded into No. 5 High Street in about 1926. It remained at 4 & 5 High Street until it moved to its present larger store at the Westgate Centre in the 1970s.